Views like a living painting, along the Poipu shoreline all the way to Niihau, 180 degree views of crashing waves and nature. The condo features rarely found in oceanfront condos in Poipu...Full air conditioning. New furnishings in late 2017, slate flooring with designer details like vessels sinks in the bathrooms and bamboo finishes. Carpeting in the bedrooms. Two separate suites can accommodate a family of four or two couples with privacy for all. The master bedroom has stunning ocean views with a California king sized bed and a bathroom featuring slate and glass block. The garden side guest bedroom has two twin beds which can be made into a comfortable king bed (please let us know which configuration you prefer). While the garden side guest bedroom doesn't have an ocean view, the tropical bird songs from the garden area are lovely. Both bathrooms are "in-suite" for maximum privacy. The unit has a fully equipped kitchen with an adjacent dining area with seating for 6 people at the dining table and seating for 2 at the kitchen bar. A full sized washer and dryer complete the amenities for this unit. This condo had another major remodel late 2014. New kitchen, including granite, cabinets and appliances. New washer / dryer covered with granite work area. New carpeting in both bedrooms. Planation shutters in guest bedroom. This two bedroom condo is larger than most units in this complex and boasts an extra large lanai which will become your favorite place to just relax on your Kauai vacation. No painting could recreate the drama of the views from Poipu Shores and especially from Unit 305A. Sunsets from the lanai give an incredible vista along the dramatic Poipu coastline all the way to Niihau, the "Forbidden Island" in the distance. 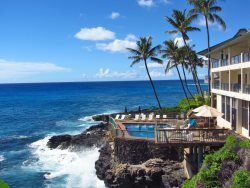 Watch the turtles, dolphins, whales, local outrigger canoes and sailboats from the lanai while you enjoy your morning coffee or evening glass of wine. Thank you for your prompt responses as we emailed with questions! What a fun surprise to arrive to a beautiful Christmas floral arrangement and your kind visit to introduce yourselves and check in with us. We loved every minute of our stay in your condo! The view is breathtakingly!! Thanks for making your property such a comfortable, inviting, place! The unit is well built with thick walls. During our week stay, we never heard any sound from other units. What a joy to walk out to the lanai any time during the day to spot turtles, Dolphins and whales! We'll be back to enjoy this beautiful condo again!